Dr. Battle is CEO and founder of Washington, DC’s renowned Cultura Cosmetic Dermatology and Laser Center, a ground-breaking medical practice merging dermatology, laser surgery, plastic surgery, and spa therapy. His office is always filled with physicians seeking advance training and patients from all over the world who seek out his expertise. 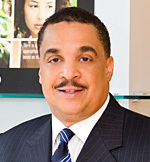 Dr. Battle is the recipient of many national academic honors and awards including; induction into Alpha Omega Alpha medical honor society; recognized as a National Institute of Health research scholar; awarded the Emerging Business of the Year Award by the Washington Chamber of Commerce; awarded the 2008 Minority Business Leader Award by the Washington Business Journal and selected as the one of the 2008 Top Dermatologist and Top Doctors by Black Enterprise Magazine. His 3 year pioneering research at Harvard helped to invent the new generation of non-invasive “color blind” cosmetic lasers opening up the field to patients of all cultures, regardless of skin of color or ethnicity. Dr. Battle is one of the most sought out teachers and lecturers in the field of cosmetic laser therapy. He is consistently in the press as a world expert in the field of cosmetic therapy. He is a member of the American Academy of Dermatology, American Society of Laser Medicine & Surgery, numerous International Societies, past Chairman of the Dermatology Section of the National Medical Association and past President of the Howard University Medical Alumni Association. He is on staff at Howard University Hospital, Department of Dermatology.